Tradition and innovation meet in the new C7+Sette of Cisternino in the province of Brindisi, a store that occupies more than 1000m², opened last May and furnished with Costan branded solutions of Epta. The challenge won by the Group was to propose systems that would contribute to shaping an industrial-chic style inspired by the past and, at the same time, to give the fresh departments a dynamic and modern look. Perfect balance between design, functionality and performance, the cabinets chosen are an example of Epta’s expertise in making every store unique, through a display layout studied in detail, to amaze consumers and improve the purchasing experience. 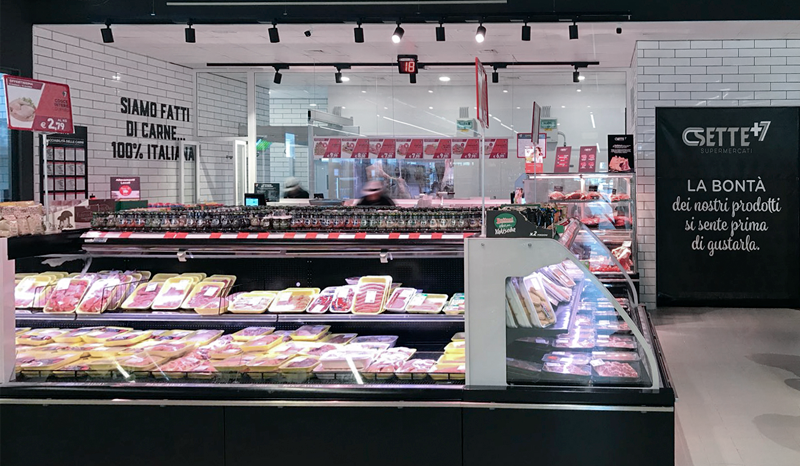 The Butcher’s and Cheese areas, true flagships of the store, set themselves apart for the presence of traditional Rossini Evolution cabinets, enriched by the exclusive fully glazed Torre module, which guarantees unparalleled enhancement of local products, displayed on three levels. Worthy of note are also the vertical positives GranVista Next of the GranFit family, equipped with full height no-frame doors. With their minimal style they bring a true “breath of fresh air” to the aisles of packaged products, making available to customers a wall of products, available at a single glance and a single gesture, improving the visibility and ease to identify the articles. The serve-over Lion Club cabinets also stand out. They are ideal for encouraging cross-selling, thanks to the possibility of mixing fresh products with dry complementary products and matching, for example, high quality meat cuts with sought-after spices. The installation is completed by Misa KLC cold rooms, with Epta Food Defence, exclusive system able to prevent, combat and eliminate numerous species of bacteria, including the best-known and most dangerous, providing full and permanent protection for its entire service life.